Mick Stephens (CEO, Timber Queensland), Linus Power (MP for Logan) and Matthew Miller (Regional Manager QLD – Commercial, Lendlease) at 25 King & CLT Sales & Information Centre at Darrau Avenue, Yarrabilba. During a recent tour of the nine-storey development, which is built from 4824m3 cross laminated timber (CLT) and 1415m3 glue laminated timber (GLT), Linus Power, State Member for Logan and Chair of the Queensland Government Economics and Governance Committee, said he was impressed to hear Lendlease’s commitment to timber as a genuine alternative to traditional concrete and steel options in the commercial construction space. “CLT and GLT products open up new possibilities building with renewable wood and it is great that we are making and using these products here,” he said. “Just last month the Palaszczuk Government’s Jobs and Regional Growth Fund contributed to the upgrade of Hyne Timber’s GLT plant. This investment will help create 42 new jobs and greatly enhance the capacity of the industry to meet the growing demand and interest for engineered timber products in the building and construction sector. 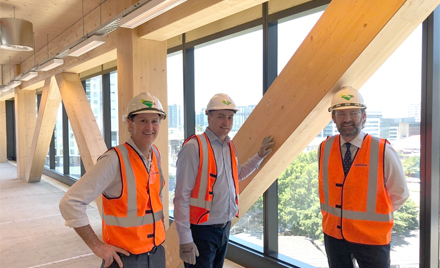 Dale Connor, Lendlease Building CEO, said 25 King is Lendlease’s fifth engineered timber building in Australia and the time savings is just one of the key benefits of working with timber on large scale developments. “Twenty-Five King has 52 timber beams and 33 timber columns on each floor. The sustainability, noise, aesthetic, productivity and lighting by products of these exposed features is changing the face of how we design and construct commercial buildings,” said Mr Connor. Timber Queensland (TQ) Chief Executive Officer Mick Stephens said property developer Shane Mundey, Raw Property Studio, has approval to start construction on an a 120-place child care centre in Wynnum West soon to be followed by a 10-storey timber retirement living building in South Brisbane. “Tall timber buildings are gaining popularity worldwide because timber is a cleaner construction material than steel or concrete. It is also renewable, making it an important part of the circular economy and move toward low carbon emission building materials. Using more timber in building construction can help meet the State’s emission reduction agenda,” said Mr Stephens. Just as a matter of interest, 25 King has about 6270m3 of responsibly sourced timber in it.